One of the persistent woes of anyone who works in a field that requires putting corresponding Hebrew and English text together in the same field is that they just don't play nicely together. Today we are going to unpack why this is. English is a wordy language. You need a lot of words to say what other languages say in comparatively few. While this can make for some beautiful reading experiences in the hands of a skilled wordsmith, it makes it harder to make it take up equivalent space with a translation. Hebrew is on the other end of the spectrum, being a fairly terse and compact language. When you translate between an unusually wordy language and an unusually terse one, the one passage will invariably be longer than the other, even though they say the same things. 'The quick brown fox jumps over the lazy dog' in English (Calibri) and Hebrew (Arial). This is the same short, ridiculous sentence in English and Hebrew. In English it is 9 words comprised of 44 characters, 8 of which are spaces. In Hebrew it is 7 words comprised of 35 characters, 6 of which are spaces. You can also see that the Hebrew line is shorter. It doesn't make a lot of difference here, but over the course of multiple sentences and paragraphs it adds up considerably. Now we're moving into the visual aspects of the alphabets themselves. Inspired by the x-height diagram on Wikipedia. Note that the top of line-height is a little taller than the ascender and the bottom a little lower than the descender. Now let's take a look at Hebrew when it is put in an analogous set of lines. Since Hebrew has no capital letters, it is missing the cap-height line, and its vav-height line is significantly higher than the x-height. While the proportion of the distances between various lines will vary from font to font (this is part of why font that are the same size will have different sized letters), Hebrew will appear heavier than any English font that has capital and lowercase letters. First, this is what they look like when the line-heights are matched up. Notice how the Hebrew baseline is lower than that of the English, yet the median is higher. Now let's try it with the baselines lined up. Now the baselines are lined up, so it is easier to see exactly how much taller the Hebrew letters are than the X-height. But the line-heights no longer start and end at the same point. Again, the exact mis-matches will vary depending on what fonts you use, but there will be mismatches nonetheless. It is also easy to see, with these two lined up next to one another, how much heavier the wide part of the lines on the Hebrew are than in the English. Which brings us to our next problem point. Contrast is the font term for how the thick and thin of a letter is distributed. The standard contrast for Latin alphabets is for the vertical lines (strokes) to be as heavy or heavier than the horizontal ones. Times New Roman font. Note the thicker vertical lines and the thinner horizontal ones. Elephant font. This font has extreme contrast. Reverse contrast is the term for fonts where the opposite of the standard weight distribution is used, and they tend to draw attention to themselves. While this can be great for signage, tends to make for a rotten reading experience for an entire paragraph or longer. Wyoming Spaghetti Plain font. It's a reverse contrast Latin alphabet font. Would you like to read a book set in this typeface? If a website put all their body text in it, would you take it seriously? 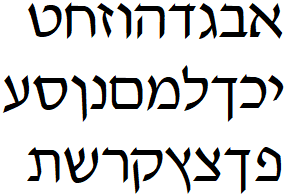 Hebrew, on the other hand, usually has heavier strokes on the horizontal than on the vertical. The contrast can vary a little or a lot, but that's the standard for the Hebrew square script (as opposed to Paleo-Hebrew, which was derived from the Phoenician alphabet and isn't used anymore). Vilna font. Compare the contrast here to that of Times New Roman or Elephant. This is part of why those English fonts that are supposed to look like Hebrew look so appallingly bad. Only part, mind you. It's generally a silly idea. Kanisah font. I understand why people were curious enough to make one of these, but I don't know why we continue to use it. Can't we declare this experiment failed already? Moreover, Hebrew tends toward a higher contrast than English. Times New Roman is a very standard degree of contrast in English and Vilna is only slightly on the heavier side for Hebrew. The contrast level in Vilna is much closer to that of Elephant, which is considered rather extreme and stylized for English. When you stick Hebrew and English on the same page, the weight of the lines in their alphabets are at right angles with one another. As your eye moves between the two, your brain needs to keep reversing its expectations of contrast in order to recognize the letters. Even if you don't notice it consciously, it contributes to the weirdness. Between different levels of contrast and different heights of their core letters, when you view a paragraph of English next to a paragraph of Hebrew, even were the baselines and lineheights to match up perfectly, they will give a different sense of blackspace vs. whitespace. Here are the first five verses of Leviticus, in Hebrew and English, both in 12 pt font. Hebrew in Keren, English in Times New Roman. Notice the disparity in length despite being the same text. Also notice how, despite both being 12 pt font, the lines are not level with one another. If we apply a blur to these texts, it The difference in visual weight distribution becomes more apparent. 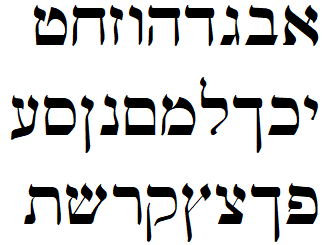 Despite being the same size, nominally, the Hebrew appears darker and appears to have more space between the lines. These two texts are also arranged in the more common Hebrew-on-the-right-English-on-the-left layout. This means that when trying to read the texts, they seem to be on a collision course toward one another. Recently, some publishers, Koren most notably, have been experimenting with lining texts up the other way. This results in the texts appearing to run away from one another. In other words, when you have Hebrew and English texts side by side, there are going to be problems no matter how you arrange them. This doesn't cause as much differentiation between the two as you might think. In my opinion (and this is my blog), it causes less visual friction than the difference in contrast. But it's still there. The Latin alphabet is composed almost entirely of vertical lines and rounded strokes. The angles, where it has them, tend to be acute and sharp. English letters made of circles and straight lines. Calibri font. English letters with angles. Calibri font. Notice how acute the angles are? Hebrew, on the other hand, is made up almost entirely of horizontal and vertical lines, and where it has angles they tend to be around 90 degrees and rounded (or sometimes turned into mini t-junctions). The difference in shapes between Hebrew and English fonts will always make them somewhat distracting when in close proximity to one another. Serifs, according to the most widely accepted theory, started as the flicks a pen or brush makes at the end of a stroke, then became stylized as carvers, first of stone, then woodblock, worked with them, and finally cast metal movable type, each approximated and altered them to suit the specs of their own medium. Not all Latin alphabet fonts have serifs. These body paragraphs are written in a sans-serif font (Asap). Our headers, however, are in a serif typeface (Libre Baskerville). As with most Latin serif typefaces, they have serifs at the terminus of most straight strokes. Hebrew, on the other hand, has almost nothing that could be called a serif. Letters that have a horizontal bar on their upper sides usually have a slight upward flick on the left, but the bottom of the letter is usually correspondingly rounded, meaning it is not a true serif. Davka David font. Notice the upward flicks on the left side of the upper horizontal bars. Vilna font. This font also has little flicks on diagonals, but they don't look like Latin alphabet serifs. Text from the Sim Shalom prayer book. This font is one of the few that attempts a slab serif on the upper left of horizontal strokes. It is widely considered ugly and unpleasant. Eric Gill, who was one of the best early modern Latin alphabet font designers (if a rather terrible human being), made a Hebrew font as well. He put serifs on it. This is it. Gill Hebrew. Note the serifs. Now go bleach your brain. This is a super picky difference, but as a calligrapher, it's one that changes your entire experience of writing. There are two ways to produce thick and thin lines when writing: translation and expansion. Translation refers to how you move your pen through space, how the angle of the nib changes in relation to the horizontal. This video of Seb Lester drawing famous logos by hand shows how to make thicker and thinner lines by translation. Lester uses a pen with a poster nib, which has zero flexibility. Those are trying to reproduce widening of the stroke toward the bottom produced by increases in pressure on the pen nib. English serif fonts don't have anything like that. English sans-serif fonts definitely don't have anything like that. The fonts that do retain this kind of thick/thin are the ones based on pointed pen hands, like Copperplate, or brush fonts. All the thick lines there are stand-ins for pressing more heavily on those strokes. Unfortunately, this kind of font is also ill-suited to be paired with Hebrew fonts. It's based on writing done with a pointed pen, while Hebrew tends to imitate broad pen hands, even though both use expansion. English pointed pen hands tend to be sharply angled, while Hebrew ones tend to be quite upright. Pointed pen fonts are cursive, which is to say that they join letters together, but ligatured Hebrew fonts are basically unknown. There are exceptions to all of these rules, but none of those exceptions pair much better (and some of them are hideous by themselves). Unfortunately, there's no way to solve these problems. The best we can do is to try to mitigate them. If you have a choice of fonts, which is not always possible if you are working with an institution where fonts are dictated by branding guidelines determined without thinking about this problem, try to choose mono-line fonts for both Hebrew and English so that the problems of opposing contrast are eliminated. If you are creating fonts from scratch, try to create ones that have baselines, ascender heights, and descender heights that all line up. If you are working on a very small amount of text, like a logo, put the English in either all caps or all lower case and use the same weight of line for both fonts. Try putting one above the other, or otherwise creating visual space between them, to de-emphasize the difference in text length and text-direction. If you have to put them next to each other, justify your paragraphs. And, when all of this doesn't work perfectly and it still looks weird, remember that it is not a personal failure.